A whole variety of baskets were needed for the fishing industry. These ranged from highly adaptable and regionally variable sculls, murlins and rips to very precise and prescriptive herring quarter crans (used for carrying and measuring fish). There were also creels, which fish-wives used to carry on their backs when selling fish, often with rips balanced on top to display their wares. Creels too varied in form from north to south, and even more so from east to west. Arm creels were also used in some regions, such as Arbroath. 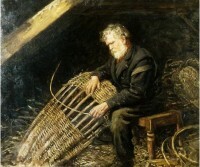 And there were baskets for locally specific jobs associated with fishing, such as bait baskets and lobster creels, as well as regionally specific forms such as Orkney and Shetland kishies and budies made from dockens, rattan or straw. A question which has provoked a great many assumptions and opinions is, ‘Who made these baskets?’ The temptation has been to assume that, with the exception of the quarter cran, which had to be made by trained basket-makers who had completed an apprenticeship, most fishermen made their own. From our research so far, this looks unlikely. It is, however, surprisingly difficult to find out any information about this now. If anyone browsing the site has information about this, please contact us.